How is Removal Like the Wu-Tang Clan? 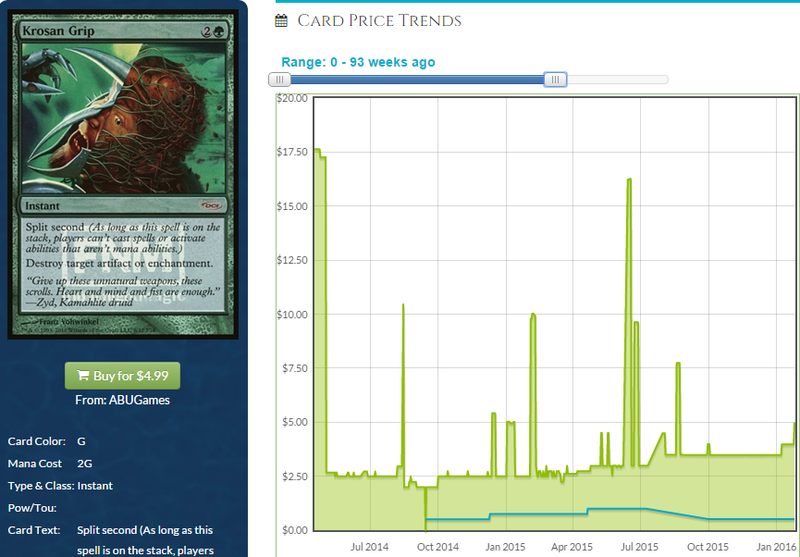 Last week, we talked about the changes to the rules of EDH and how those changes can affect prices. A major event like a significant banning and a significant change to how the color identity rules work coupled in the same announcement gives us an embarrassment of information and led to some pretty significant price changes, as we all predicted. 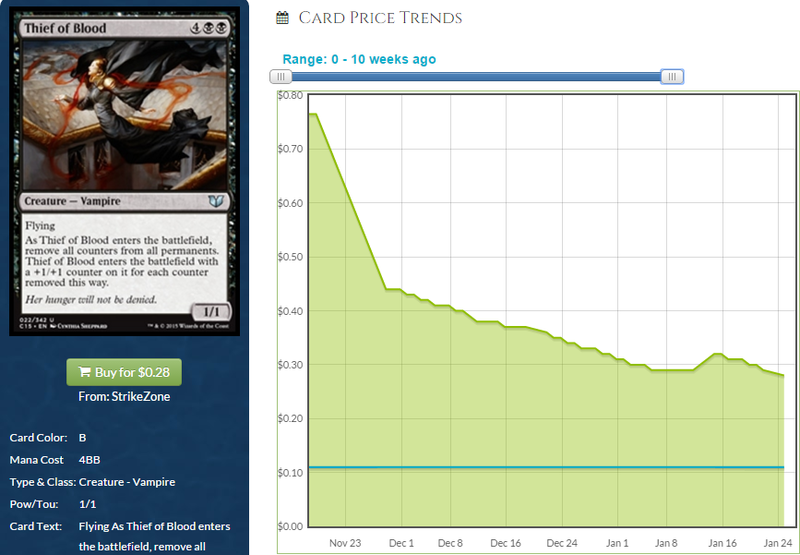 Foil Sen Triplets shot up $30 over a week ago from where it was hovering around $40 to the $70 people are trying to charge on TCGplayer now. Most of the smaller retail sites are out of copies and the excitement about how much fun this card is going to be to play seems to be responsible. This was something we predicted would happen last week and it happened very quickly. Similarly, Seedborn Muse was roughly a $15 card last week and it’s sold out nearly everywhere online as people rush to plug the hole left in their deck by Prophet of Kruphix. Seedborn Muse is not even half as good as Prophet and its price won’t hold, but people are going to try anyway. Something like $27 to $30 seems to be the growing rate and if history is to be believed, the price should stabilize between the pre-spike price of $15 and the post-spike price of $30. 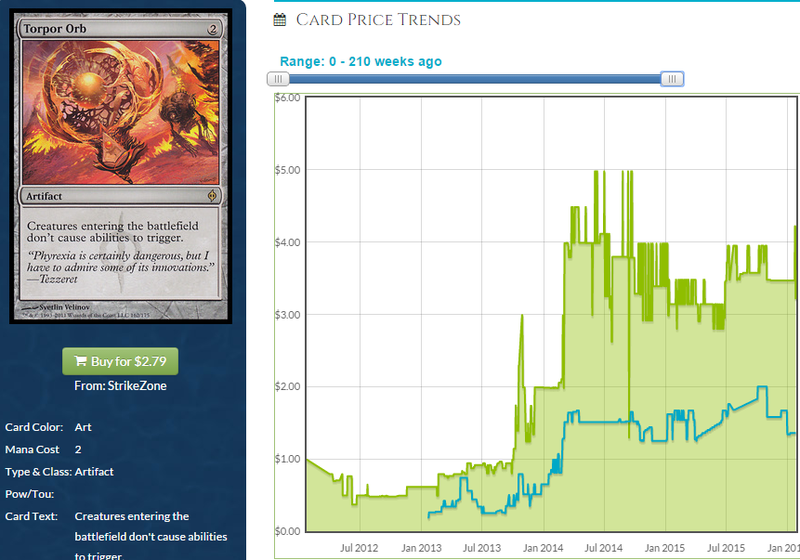 $22.50 is still a lot to pay for a card that doesn’t even give your creatures flash. If Muse were that good in that spot, people would have been playing it already alongside Prophet. This was predictable as well. Now that the dust seems to have settled and we’re thinking about which decks to build in the future and which cards we want to include in those decks, we should address something that is rarely discussed for some odd reason. People love to talk about what they want their EDH deck to do. They make a pile of a ton of cards that can go in the deck that might accomplish the goal and set about the nearly impossible task of paring the deck down to just 99 cards plus a commander. This is a decent way to build a deck, except that it ignores something pretty fundamental that people who don’t play a ton of one-on-one EDH forget sometimes: other players exist. That is to say, they’re trying to do stuff and you should probably try and stop them from doing their thing so that when you do your thing, you win. Planning an epic Insurrection is cool unless some guy makes infinite mana with Palinchron (another card we predicted would spike, remember?) and kill you before you even get the mana to do it. Why trifle with other formats when EDH is so predictable? You need to devote space in your deck to dealing with what they do, and while this isn’t a deckbuilding column (mostly because I told you how I build decks in the last paragraph even though I essentially just mocked people who build that way in the same paragraph), we should consider putting removal and cards that stuff their strategies into our decks. If everyone does that, we can make some money predicting the cards they’ll use. Some of the stuff that is good removal is always going to be good removal and the prices of those cards are going to reflect that. 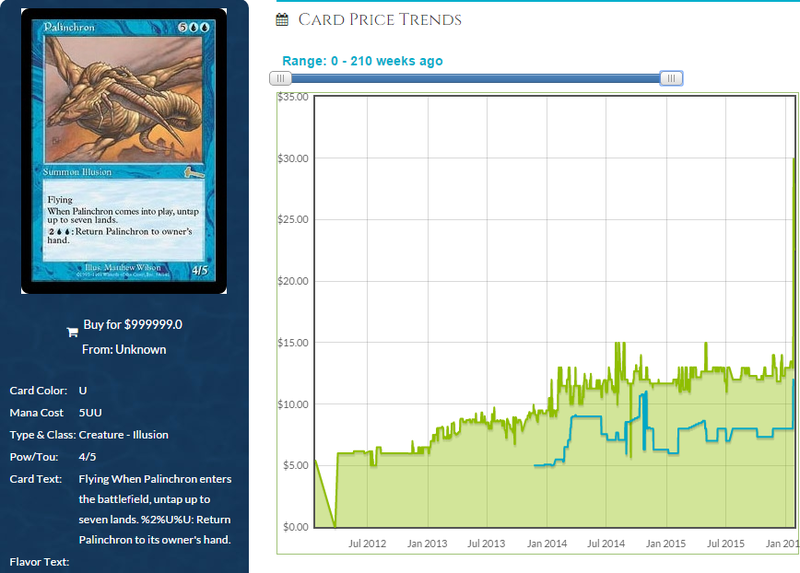 I was expecting the price of this card to be relatively stable to help me prove my point but this does the opposite. 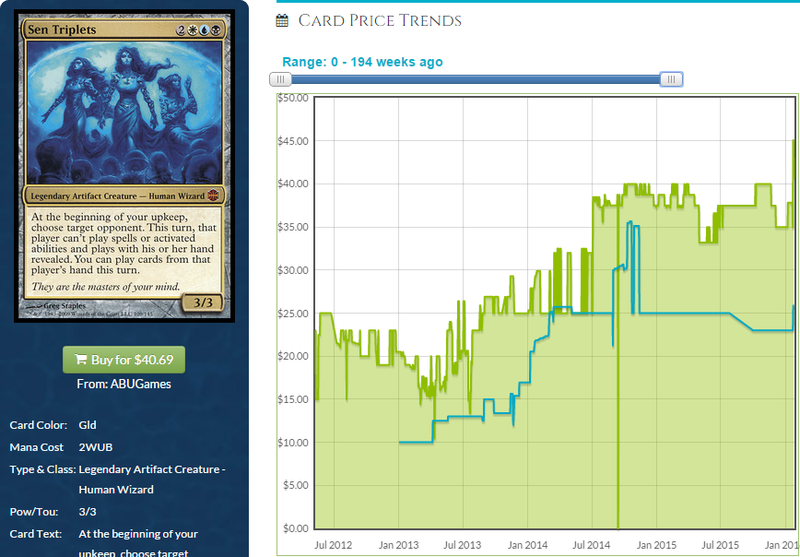 I had to shift the axes of this graph because this was like $35 at some point. Who knows why these things happen? The point is, Legacy monkeys with this from time to time, but this is basically always going to be a solid EDH spell that green decks should run. You stop them and they can’t stop you from stopping them. Seems solid. 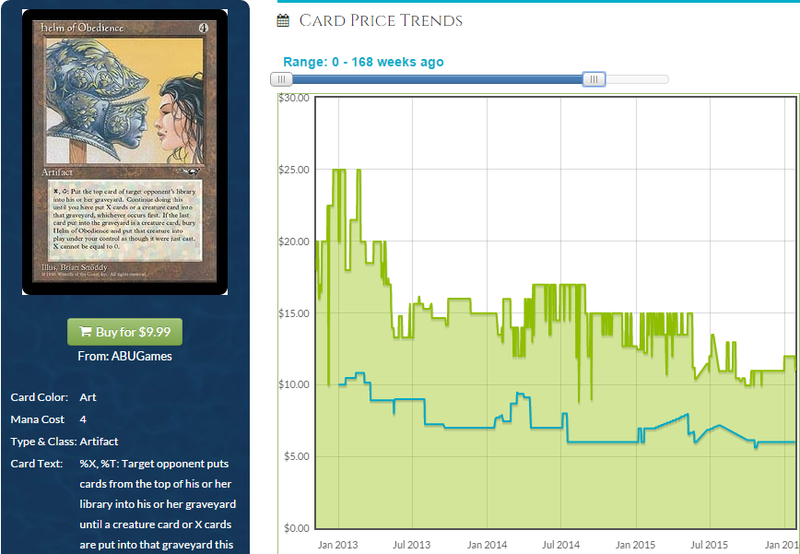 It took a few Commander reprints to drag this foil kicking and screaming away from the $25 mark. 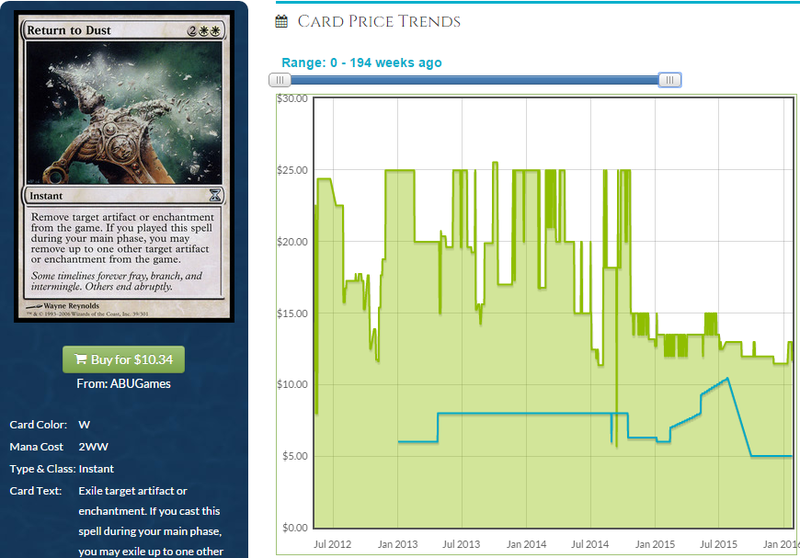 Am I showing you declining cards because I don’t know how to structure an argument? No, I want to prove the point that obvious removal is sometimes going to stagnate. What we want to be thinking about is how the new strategies brought about by new cards work. We know how they work so we should be able to dismantle them. Most of this series has discussed new events and how to buy ahead of the people building to make those work, but we should also think about how to buy ahead of the people who are going to get sick of losing to that strategy. We knew that Eldrazi Displacer was going to push cards like Palinchron up, right? How do we beat that? What it stops – What doesn’t it stop? Torpor Orb is a card no one really wants to play with in every EDH deck because it also neuters your own strategies sometimes. Shutting down crazy enter-the-battlefield triggers is a fairly important thing to do, though, and the card is growing accordingly. When people start doing stupid stuff they couldn’t before because they needed Deadeye Navigator and now have Eldrazi Displacer to try that nonsense in decks like Mangara of Corondor, we’re going to want to shut them down. This is great against Roon and Brago; a ton of decks rely on getting value from creatures that enter the battlefield and flashing them out. This even stops enchantments like the Aura Shards they would really like to use to blow up your Orb. How many people play with cards like Viridian Zealot? Not as many as play with Acidic Slime, I’m guessing. I actually don’t even have to guess. EDHREC is pretty clear on how little Zealot is played: it appears 225 times in 16,945 green decks, or roughly 1.3 percent of them. Acidic Slime appears nearly three times as often. Enter-the-battlefield triggers are integral to EDH, and stuffing them is going to hurt people’s feelings. Good. They’re trying to kill you, remember? If we expect a surge in enter-the-battlefield shenanigans with the printing of Eldrazi Displacer, we can expect an increase in the efficacy of Torpor Orb and an increase in its price. A price of $3 isn’t the best place in the world to buy in, but this is a card I have been accumulating for a while. When these were still around $1, they were on my short list of “throw-in” cards I would use to even up a trade that was $1 in their favor. This is also literally the only card on my PucaTrade want list. Orb is a nutso card and it’s from New Phyrexia which has $30 Spellskites and $5 Unwinding Clocks. Is Orb more useful than Clock? I think so, but the Prophet banning has made people scramble to find terrible cards to replace it instead of jamming a card that will trip them up. The banning of Prophet nearly explicitly said Consecrated Sphinx was safe, but it also implied Deadeye Navigator was also looked at and they decided to keep it legal. I like Torpor Orb a ton, frankly, and its current price leaves some room for real growth, even if it’s only like $2 (otherwise known as 66 percent of its current price, which is nothing to shake your gnarly old fist at, you geezer. Face it, no one wants to listen to Sinatra and dance the jitterbug anymore. Your day is over; die with some dignity) which would pull it even with Unwinding Clock, a card that is in three percent of all eligible EDH decks. That’s more than Orb is in now, but expect that to change. What it stops – Graveyard BS. Believe me, you want to stop graveyard BS. According to EDHREC, graveyard BS makes up over 41 percent of all EDH BS, up from 33 percent before Wizards printed Mazirek and Meren. This has additional upside from other formats (sometimes) and at its current price, it’s not too expensive to sink a little money into. I’m not as convinced we should buy $12 foil copies for EDH, but the non-foils are growing and this is a solid “enough of your BS” card. 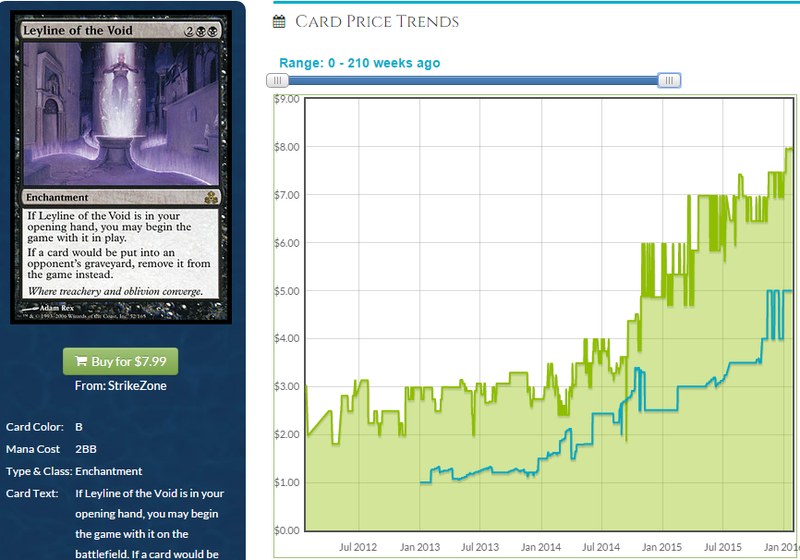 Expect graveyard BS to be on the rise with Mazirek being the most-built commander according, again, to EDHREC. 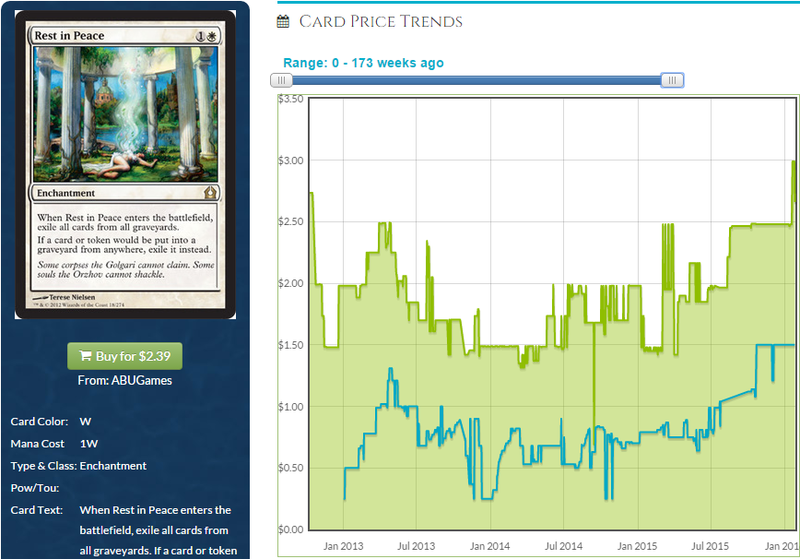 Also popular this week appears to be a bunch of commanders we can shut down with Torpor Orb. Handy. With Meren decks gaining so much popularity, it’s important to have ways to shut them down. Rest in Peace does just that, preventing them from even getting experience counters—not that they could bring anything back. This also has the advantage of pairing well with Helm of Obedience, which is at a three-year low since Legacy isn’t as popular as it used to be. A way to shut them down and sometimes have an “oops, did I win?” combo with just one more card seems fine, and I recommend Rest in Peace even if all you do is wipe the graveyards when you cast it before it’s dealt with. A 1W spell that clears every yard is kind of like the Wu-Tang Clan, in that it ain’t nothing to @#$% wit’. Not everyone likes to play white, so here is another option for you. This is growing steadily and I don’t see a reason for it to stop, so why not park a few bucks in a proven winner that could see some more upside soon? What it stops – Ezuri, but other stuff, too. This gets my vote for “most underrated card in Commander 2015. I realize it’s technically printed as an uncommon, but that is suggested power level. There aren’t three of these in every Plunder the Graves deck—there is one. That means there are as many copies of Thief of Blood as there are Meren of Clan Nel Toth, and Meren is currently sitting at a shade under $10. Is this a $10 card? No, not really. But it sure does ruin #%$ when you cast it. You notice how Ezuri and Animar are both pretty popular? Well this pulls those cards’ pants down. Superfriends? Super dead. Vorel of the Hull Clade? More like Vorel of the All… Dade… all of my hydras are dade. They’re dead. Dade means dead. He kills their hydras, guys. I lamented the terrible design of this card a few different times, because it hoses some decks and leaves other entirely unscathed, but that doesn’t really matter financially. All that matters is that this is a super good hoser card and people are not all that interested in holding onto their copies. In a year or two, this could be real money if it starts to see real play—and the popularity of decks like Ezuri and Animar should make this a card that people look to to solve their problems. If you have never resolved this against a full board, do it. It gets everything. I was pulling counters off of Vivid lands and cackling like a lunatic, nevermind the Assemble the Legion I got down to nothing. You know what is a fun thing to do with a vampire that has just gorged itself on the counters the Ezuri player was putting on his Woodfall Primus so he could sacrifice it every turn? Sacrifice it to Jarad, Golgari Lich Lord and end the stupid game. These cards are all going to be more effective against the new field than they were before Commander 2015 and Oath of the Gatewatch came out. New decks like General Tazri (hosed by Torpor Orb in a huge way), Ayli, Eternal Pilgrim (Leyline of Punishment or Everlasting Torment?) and new cards like Eldrazi Displacer and Thought-Knot Seer are shaking up EDH, and if you can stop them, you should, right? Who wants to lose to that crap? New events give cards that help decks upside, but it’s also important to take a look at cards that hurt those strategies as well, especially the ones which are the most popular new decks being built. 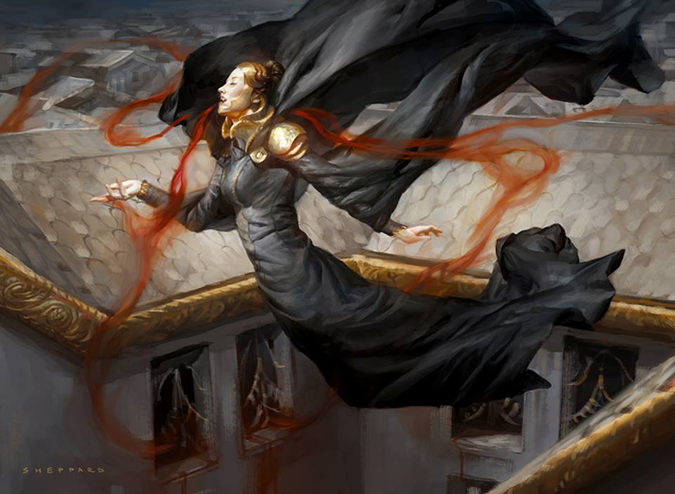 Check EDHREC every week to see what’s hot and think about what hoses those decks. Or, I guess, just keep reading my column, because I’m going to do that for you in all likelihood. Next week I may do some more examples of hosers that I think have upside in the new EDH landscape, or maybe I’ll talk about something else. We’ll burn that bridge when we get to it. As always, thanks for reading and let’s get a $#%storm started in the comments section. Sound good? What device or browser are you on? Got the same problem. Using Chrome and tried IE as well. They come up as Untitled.png links which is odd. Wiw loving some of these for hosing decks. Not sure how i missed Rest in Peace before, but I’m loving a little of that. I’ll look forward to next week, as always! I’ll come back and read this alticle once the pictures are fixed. Has happened at least two other times this week (DJ: Mindslicer; Travis: Playing Chicken). They seem to get fixed after I mention it in comments, so may I suggest that whoever you have that is fixing the issue starts working on preventing it from recurring. They work just fine. What device are you using? Thanks for sharing your –WITTY UNPREDICTABLE TALENT AND NATURAL GAME– in regards to EDH specs. I would be remiss if I didn’t mention that: –COMMANDER RULES EVERYTHING AROUND ME– Cream, get your money, speculating on new EDH Meta Y’all. I think you forget something about Seedborn Muse.Is a 2/4 creature instead of 2/3 Prophet so harder to kill.But the most important is that Muse’s ability untap all PERMANENTS you control during it’s other player’s untap step so I think is better than Prophet that untap only creatures and lands. I really like your analysis for Thief of Blood! Seedborn Muse doesn’t give all your creatures flash though.